Creating a vegetarian moussaka will satisfy anyone's need for this delicious Greek dish. In fact, the cheese components of the recipe can be replaced with soy cheese or tofu for a completely vegan version, as well. 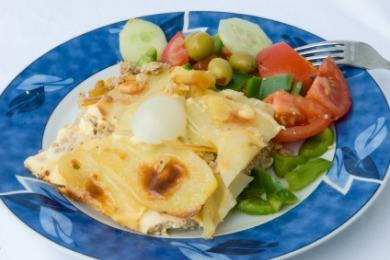 Moussaka is a lasagna type dish that originated in Greece. Rather than pasta, moussaka is usually layered with eggplant. Traditional moussaka is made by layering thinly sliced eggplant, mild cheese, and ground meat in a square casserole and then pouring Bechamel sauce over the whole thing. There may be one, two or three layers of each component but it usually ends with eggplants, sauce, and cheese on the top. The casserole is then baked for about one hour or until heated through. Because of the versatility of this casserole it is simple to create a variety of vegetarian moussakas once you know the basic recipe. This basic recipe has an almost meaty flavor thanks to the inclusion of portobello mushrooms. You can assemble it a day ahead. Just cover it tightly with plastic wrap and keep in the refrigerator until you need it. Salt the eggplant slices on both sides with kosher salt and set aside for 30 minutes. This removes bitterness. Preheat the oven to 425F and oil a baking sheet. Rinse eggplant and pat dry. Brush both sides with oil. Arrange in a single layer and bake for 10 minutes. Turn the slices over and continue baking until tender. This may take up to 20 minutes. Remove the eggplant from the oven and reduce the temperature to 350F. Heat ¼ cup of oil in a skillet. Add onion and celery, and saute until the onion is tender. Add garlic, beans, and mushrooms to the skillet and cook about 10 minutes, stirring often. Add the tomatoes, parsley, oregano, lemon, and cinnamon. Whisk in flour carefully and stir for 2 minutes. Whisk in milk, stirring constantly until thickened. This will take about 5 minutes. In a large bowl beat egg yolks until well blended. Add 1 cup of the hot milk mixture to the yolks, 1 tablespoon at a time, whisking constantly. Pour the yolk mixture slowly into the remaining hot milk mixture, whisking constantly. Simmer for 2 minutes and then remove from heat. Oil a 13x9 inch baking dish. Arrange half the eggplant in a single layer on the dish. Spoon the tomato mixture over the cheese. Sprinkle with 2 tablespoons Parmesan cheese. Repeat with a layer of eggplant. Pour the Bechamel sauce over the casserole and sprinkle with the remaining Parmesan cheese. Bake at 350F for about 50 minutes, or until heated through. Try this basic recipe, then experiment with your own delicious variations for a special dinner for family or company. Just serve it with some garlic bread, a great salad, and some fresh melon for dessert and you will have a vegetarian meal that even your meat-eating friends will love.